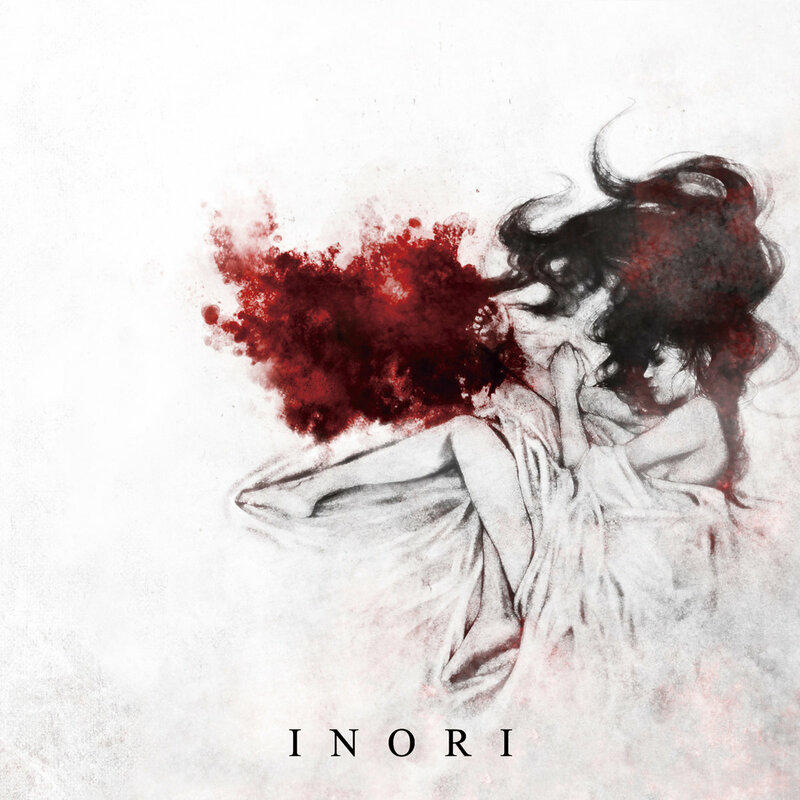 Japanese BM/ doom act Kanashimi celebrates a decade of mournful existence by releasing a second album “Inori” of fusion depressive BM / funereal doom. Sole K member O Misanthropy’s style is to take tunes and motifs familiar to listeners of mainstream Japanese pop music and make them the basis of the songs on the album. Beneath the blowy blizzard ghost-wraith vocals and the fuzzy noise guitars, these pop melodies (played on piano) are actually loud and clear – and very sad and plaintive they are too, even with all the BM distractions and the irritating cold-air synth wash overlying them. Actually the melodies aren’t that bad – some of them can be very sappy by themselves but then again it’s what the musician does with them, how his original arrangements around and with them combine to generate emotion and tension, how those contrasts are dealt with over the course of the songs, and whether the listener feels comforted or more fearful, or just irritated, that are important. There is plenty of heartache and pain, and listeners may find themselves crying at the intense emotion expressed on some songs – and on others, you may be thinking that your emotions are being mined and manipulated and you’ll come away feeling exploited. Having said all that, I wasn’t too encouraged by first track “Scar of Heart” which piled on the heartbreak and angsty feelings with constant repetition and howling vocals not having much to say. “Tomurai” sticks to the template of pushing your face (and ears) into the pool of melancholy with repeating melodies and riffs though this time the main tune is not bad and actually seems quite restrained. If only that howling would just stop altogether because the melody has a sad and stoic dignity, and by itself would be comforting in its repetition. The guitars chime in sympathy with the piano music but don’t add much beyond a second layer of sound on top of the melodic theme. The song that follows after even sprinkles a few sugar-pop elements here and there which might either annoy the hell out of listeners or make them laugh at the blatant pull on the heart-strings depending on their mood. “In My Tears” is full-on heartache beneath blizzard-storm vocals and bleary guitar smear going for eight minutes – if I had heard it on its own, I probably would have a better opinion of it as the actual piano music is fine enough but in the context of an album where each song is very repetitive and the basic style of performance rarely changes, the song just feels like one more unit off a factory production line. Later in the album, O Misanthropy tries something less BM-noisy and more schmaltzy, and then a song salvaging hope and dignified majesty in an album that so far has been full of forced bleakness worked over and over. Turns out that the only really decent music here is the piano pop tunes that O Misanthropy employs as the base to structure his songs around. The good thing is that they emerge with pathos and dignity intact while the rest of the bluster – especially those vocals – fades into the background after the album finishes.